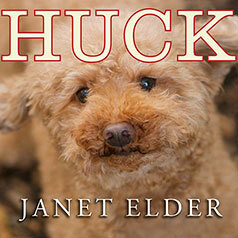 In the tradition of Dewey, A Lion Called Christian, and Homer's Odyssey, Huck is an unforgettable true story of a lost puppy and a family who learned a valuable lesson about tenacity, faith, and the generosity of strangers. Michael was four when his relentless campaign for a dog began. At seven, he made a PowerPoint presentation, "My Dog," with headings like "A Childhood Without a Dog Is a Sad Thing." His parents, Janet and Rich, were steadfast; bringing a dog into their fast-paced New York City lives was utterly impractical. However, on a trip to Italy, a chance happening leads Janet to reconsider, a decision then hastened by a diagnosis of breast cancer. Janet decides the excitement of a new puppy would be the perfect antidote to the strain on the family of months of arduous treatments for her illness. The prospect of a new puppy would be an affirmation of life, a powerful talisman for them all. On Thanksgiving weekend, soon after the grueling months of treatments are over, Huck, a sweet, mischievous, red-haired toy poodle, joins the family and wins everyone's hearts. A few months later, the family ventures to baseball's spring training, leaving Huck with Janet's sister in Ramsey, New Jersey. Barely twenty-four hours into the trip, Janet receives the dreaded phone call: Huck has slipped through the backyard fence and run away. Broken-hearted and frantic, the family catches the first plane to New Jersey to begin a search for their lost puppy. It is a race against time, for little Huck is now lost in an area entirely unfamiliar to him, facing the threat of bears and coyotes, swamps and freezing temperatures, rain and fast cars. Moved by the family's plight, strangers—from schoolchildren to townspeople to the police lieutenant—join the search, one that proves to be an unyielding test of determination and faith. Touching and warm-hearted, Huck is a spirit-lifting story about resilience, the generosity of strangers, and hope.